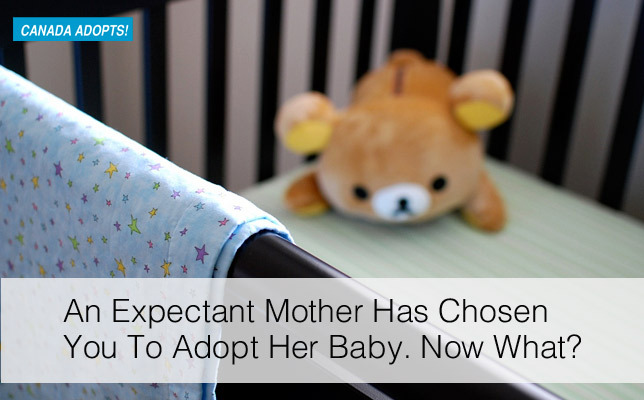 Being chosen by an expectant mother to adopt her baby is an unforgettable event. Once it happens, it’s hard to think about anything else. You replay the moment in your mind again and again (and again!). You fixate on the delivery date until it’s permanently ingrained in your head. And you start making plans for the future. With so many mixed emotions, it’s hard to stay grounded and not feel like a basket case. By all means, soak up the moment and all of the excitement surrounding it. You’ve earned it. But keep in mind that you haven’t reached the end of your journey. In many ways, it’s just beginning. There are still a million things you need to do — and, as you’ll see, none of them is easy or straightforward. Everything feels surreal — like living in a dream. So don’t be surprised if your thoughts and feelings go running off in all different directions. It’s normal, part of the process. Enjoy the ride as best you can. Eventually things will settle down and return to normal — or at least to a new normal. As exciting as an adoption match is, it’s not an adoption. I guess I don’t have to tell you that a lot of things can happen between now and the delivery date that could send you back to the drawing board. The expectant mother could have a change of heart. Or, as unlikely as it may sound after everything you’ve done to get to this point, you might decide that you’re not a good fit. Needless to say, there are so many unknowns, things that you won’t know for days, weeks or even months down the road. Keep your adoption professionals in the loop. And use the time now to get to know the expectant mother better, find answers to your questions, and build your relationship. Announcing an adoption match isn’t the same thing as announcing a pregnancy. For one thing, some of your closest family members may not have even known you were trying to adopt. Plus, because most people don’t understand adoption or have out-moded views about it, their level of excitement may not match yours. They may be worried that the expectant mother will want her child back and put a damper on your enthusiasm. Get used to it, if you’re not already, and think of this as a teachable moment. And if you have children, they’ll eventually need to know too in an honest and age-appropriate way. It’s only natural that you’ll want to share your news with friends. Who wouldn’t? If they’ve been on your adoption journey with you, they’ll most certainly want to know. But it’s tricky. Once your story gets out, it’s not yours anymore. Think carefully about who to tell and what to tell them. Keeping the news to yourself will be tough, and some of your friends may feel hurt and left out. But worry about that later. For now, think about yourself and how to protect your heart. So many parts of the adoption process you can’t control. But this is one part you can. Depending on what your employment situation is, you’ll need to let your boss know that you’ll need time off. In most cases, the news will come out of the blue so approach it with care. If you have concerns about whether the placement will work out or not, wait until the last minute to make your announcement and think twice about taking on any long-term projects. Your co-workers will likely want to share in the excitement and mark your leaving with some kind of celebration. It’s up to you to decide how involved you want to get in it. After all, there’s nothing worse than going big with your announcement and then returning to work and explaining that things didn’t work out. Many hopeful parents use this time to nest and prepare for ther home for their baby’s arrival. Whether it means stocking up on necessities like diapers, wipes and sleepers or taking on a bigger project like decorating the nursery, it up to you. Many waiting parents say that preparing their home gave them something to do, made the placement more real, and filled them with hope. Others, however, worry that doing too much beforehand could jinx their placement and refuse to do anything until the very last moment. As with so much about open adoption, it’s a personal choice. No matter when the expectant mother is due, it’s never to early to develop a hospital plan. This is something that you and the expectant parents will need to work out together. How much involvement do you want to have in the delivery? Will you be in the room with her? Who will hold the baby first? How will the placement occur? Giving birth is such an emotionally-charged event, it’s important to work out the details beforehand so that you and the expectants parents are on the same page. In addition, you should make sure that the hospital staff is up to speed about how an open adoption placement works and is aware of your wishes. Delivery day will be stressful enough. You don’t need any additional surprises. Adoption laws come under provincial jurisdiction and vary by province. If the placement takes place in another province, you’ll need to know not only the adoption laws in your province, but also those of the expectant mother. Your legal team can fill you in on the details. But it can’t hurt to familiarize yourself now on how the relinquishment and finalization process works and to make sure that all of your paperwork is up to date. Depending on where the expectant mother lives, you may want to start researching flights and hotels for the best rates and availability. Because everything is so unpredictable, you may need to book a flight in the last minute. Knowing what flights are available, and finding a direct route, can save you a lot of trouble down the road. Since the baby could arrive at any time, you’ll want to leave yourself enough time to get to the hospital in time for the birth. You also want to look for hotels that are near the hospital or the expectant parents’ family. This is another item for down the road, but again it’s never too early to start thinking about it. After all, if the adoption goes through, you and the expectant mother will be tied together for life. Your adoption professional can help you hammer out a plan with the expectant mother. Some of the things you’ll want to consider is what kind of ongoing contact do you want to have after placement? How do you plan to keep in touch — through emails? calls? texts? visits? Again, it’s up to you and the expectant parent to work out the details. Generally speaking, if you’re uncertain about what to do, it’s better not to promise too much — or at least more than you can handle. Start small and gradually expand contact over time, as your trust and confidence in each other grows. There’s a lot you need to think about when you find a match. The more prepared you are, the easier it will be. For now, take things one day at a time and enjoy the moment while it lasts. But don’t leave things to the last moment. If all goes well, your placement day will come sooner than you think!